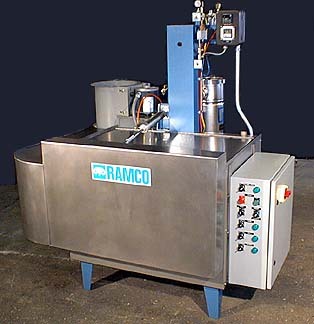 This Case History is a washer designed and built for use with the Oakite Eurostrip Process. The process uses modern paint stripping technology to replace methylene chloride and traditional hot alkaline strippers. The system is engineered for high turbulence of a proprietary paint stripping chemical – Eurostrip. Multiple jets are distributed within the processing chamber, directed at the working zone to activate and enhance chemical activity. The system is built of heavy gauge stainless steel for the processing chamber, lip vent exhaust system and exterior insulation panels. A Nema 4 rated electrical enclosure includes selector switches, pilot lights, digital indicating temperature controller, digital cycle timer and lockout-tagout disconnect switch. An automatic opening and closing cover is included to reduce emissions and save on energy. 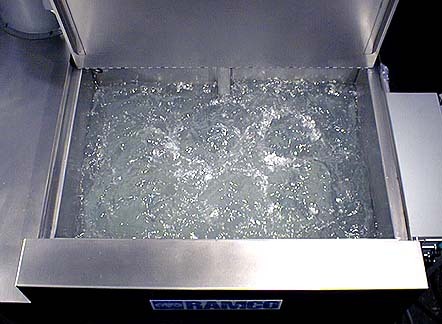 A large capacity filtration system is included to remove accumulated residue and extend the life of the solution.The system pictured above has a 90 gallon capacity and can handle a 34″L x 20″W x 15″H volumetric load weighing up to 150 pounds. Other sizes and loads are available up to 2000 pound capacity. Would you like to see another Eurostrip application? Would you like to learn more about Oakite and the Eurostrip process?